The competition was fierce, but 30 schools came out on top in our Best Online Colleges in Texas for 2018 list. These schools offer the convenience and flexibility of online degree programs, and one even offers free textbooks for undergraduate students as well as special tuition rates for adults, active military and veterans. You can also be assured that you will be earning the same degree as on-campus students; the same faculty teaches the online and on-campus courses in many programs. You also get the benefit of guaranteed in-state tuition, no matter where you live, when you seek an online degree. We selected the online schools in Texas based on the quality of their programs, types of courses and degrees offered, and faculty strengths, as well as school awards, rankings, and reputation, including a strong reputation for online degree programs. Note: In ranking the best online colleges in Texas, giving attention to the variety of degree programs available at the institutions is of utmost importance. For this reason, a more prestigious school in Texas may offer one, or a few online degrees, but that may not be enough for that school to rank highly among the best online colleges in the state. In this ranking, we are dedicated to showing who's leading the way in delivering quality online degree programs in Texas. Texas Tech University ranks #1 on The Best Online Colleges in Texas for 2018! Texas Tech University, a public research university founded in 1923, offers an array of degree programs. The university also offers numerous online degrees and online certification programs. A member of the Texas Tech University System, Texas Tech University enrolls more than 35,000 students. Texas Tech University's on-campus and online students receive the same degree. The university's online students can complete a number of bachelor's degrees in fields including human sciences, general studies, and plant and soil sciences. Texas Tech also offers online master's degrees in areas such as technical communication, education, horticulture, and software engineering. Students pursuing advanced study can earn doctoral degrees in agricultural education, systems and engineering management, higher education, and technical communication and rhetoric. The university offers a host of graduate certificates, undergraduate minors and concentrations, and graduate certificate preparation programs. Online students have access to support services such as IT and library resources. Dallas Baptist University ranks #2 on The Best Online Colleges in Texas for 2018! Dallas Baptist University, a Christian liberal arts university founded in 1898, enrolls about 5,400 students, with 1,800 in online programs. Dallas Baptist University offers a host of degree programs ranging from associate to doctoral degrees with nearly 60 full programs available online. Dallas Baptist University's online program offerings include a range of associate, bachelor's, and master's degrees as well as a number of undergraduate and graduate certificates. Areas of study include business administration, children's ministry, and communication. The university's on-campus and online courses are taught by the same faculty. Online students have access to an online bookstore, financial aid, and a help desk. Lamar University ranks #3 on The Best Online Colleges in Texas for 2018! Lamar University, a public doctoral and research university established in 1923, enrolls nearly 15,000 students. A member of the Texas State University System, Lamar University offers online undergraduate and graduate degree options through their online platform, LU Online. The university tailors programs and courses to meet the schedules of working adults. The university also features a Center for Military Services, joining the ranks of online schools in Texas providing resources to active duty military and veterans. Lamar University offers a number of undergraduate degree programs, including computer science, general business, entrepreneurship, communication, and sociology. The university also offers a variety of master's degree options, a doctorate in educational leadership, and several certification programs. LeTourneau University ranks #4 on The Best Online Colleges in Texas for 2018! LeTourneau University, a private, interdenominational Christian university founded in 1946, enrolls nearly 3,000 students from around the world. LeTourneau University offers a host of degree programs in education, business, engineering, and aviation studies, including many programs that students can complete 100% online. LeTourneau University has a number of unique program offerings, such as their accelerated bachelor's degree in aviation studies. Students can also complete undergraduate degrees in biblical studies and ministry, business administration, criminal justice, and psychology. LeTourneau University's online students can pursue master's degrees in engineering management, healthcare administration, counseling, and curriculum and instruction. LeTourneau University is regionally accredited by the Southern Association of Colleges and Schools Commission on Colleges (SACSCOC). West Texas A&M University ranks #5 on The Best Online Colleges in Texas for 2018! Established in 1910, West Texas A&M University (WTAMU) is a public, non-profit university with a long tradition of offering high-quality education. Since its beginning as a normal school, WTAMU has grown into a comprehensive university offering nearly 100 undergraduate, graduate, and doctoral degree programs. The university is a member of the Texas A&M University System. West Texas A&M University offers a wide range of fully online degree programs. Students from around the world can enroll in online bachelor's and master's degree programs. Online bachelor's degree programs include business administration, criminal justice, and health sciences. Online master's degree programs include business administration (MBA), curriculum and instruction, and nursing. Through WTClass, West Texas A&M University's web portal, online students can access materials including their course syllabi, assignments, resources, and lessons with detailed lecture notes from their professor. WTClass also allows students to interact with one another and communicate with their professor. West Texas A&M University is accredited by the Southern Association of Colleges and Schools Commission on Colleges (SACSCOC). Sam Houston State University ranks #6 on The Best Online Colleges in Texas for 2018! Among the best online Schools in Texas is Sam Houston State University, a public university founded in 1879 that enrolls more than 18,000 students. A member of the Texas State University System, Sam Houston University's degree offerings include more than 140 undergraduate, graduate and doctoral degree programs, with 25+ fully online degree programs. Sam Houston State University's online programs follow a semester-based schedule and enable students to earn most degrees in three to five years. The university's fully online bachelor's programs include criminal justice, general business administration, general studies, and history. Sam Houston State University also offers around two-dozen online master's degree programs. Students can complete an online doctorate in developmental education administration or instructional technology as well as a host of graduate and professional certificates. Online students have access to a host of services including library resources, advising, and career services. Sam Houston State University is regionally accredited by the Southern Association of Colleges and Schools Commission on Colleges (SACSCOC). University of North Texas ranks #7 on The Best Online Colleges in Texas for 2018! University of North Texas (UNT), a public tier-one research university founded in 1890, began with a class of about 70 students meeting in a room above a hardware store. UNT has since grown to become one of the largest public research universities in the nation, enrolling 38,000 students and offering more than 220 degree programs at the bachelor's, master's, and doctoral levels. Today, students around the world are able to attend the University of North Texas from any location by enrolling in one of UNT's online degree or certificate programs. UNT offers more than 20 online graduate degrees, five online bachelor's completion degrees, 16 online graduate certificates, and two online undergraduate certificates. Online graduate students at UNT can pursue master's degrees in the areas of business, education, health and public service, information, liberal arts and social sciences, merchandising, and hospitality, as well as a doctorate degree in learning technologies. Online bachelor's degrees are offered in rehabilitation studies, criminal justice, information science, leadership development, and applied arts and sciences. Online certificate programs are offered in the areas of education, health and public service, information, liberal arts and social sciences, merchandising, and hospitality. University of North Texas is regionally accredited by the Southern Association of Colleges and Schools Commission on Colleges (SACSCOC). University of Houston - Victoria ranks #8 on The Best Online Colleges in Texas for 2018! The University of Houston-Victoria, a four-year state university founded in 1971, enrolls more than 4,300 students and boasts more than 11,000 alumni. A member of the University of Houston System, University of Houston-Victoria offers 50+ bachelor's and master's degree programs. The same faculty teach the university's online and on-campus courses. The University of Houston-Victoria allows students to finish their bachelor's degrees online with undergraduate completion programs in areas including communication, marketing, and healthcare administration. The university offers more than a dozen online master's degrees, ranging from special education to publishing to computer information systems, as well as a number of certificate programs. Online students have access to an online bookstore, library resources, and student services. The University of Houston-Victoria is regionally accredited by the Southern Association of Colleges and Schools Commission on Colleges (SACSCOC). The University of Texas of the Permian Basin ranks #9 on The Best Online Colleges in Texas for 2018! The University of Texas of the Permian Basin, a public university founded in 1973, enrolls around 5,600 students. The university offers bachelor's, master's and pre-professional degrees, including several fully online degrees. The University of Texas of the Permian Basin's online program offerings include bachelor's degrees in marketing, child and family studies, humanities, and sociology. The university also offers master's degrees in bilingual/ESL education, educational leadership, English, special education, business administration and kinesiology, as well as several certification and endorsement programs. Online students have access to a number of services including counseling services, financial aid, academic advising, career services, and library resources. The University of Texas of the Permian Basin is regionally accredited by the Southern Association of Colleges and Schools Commission on Colleges (SACSCOC). Southwestern Assemblies of God University ranks #10 on The Best Online Colleges in Texas for 2018! Southwestern Assemblies of God University is a private, non-profit, Christian university. The school, located on the same campus since 1943, was created after the 1994 merger of three schools: Southwestern Bible School, Shield of Faith Bible School, and Southern Bible Institute. Today the school serves around 2,000 students and offers a number of associate, bachelor's, master's, and doctoral degrees, all taught from a Christian perspective with an emphasis on Bible-based education. Southwestern Assemblies of God University offers a number of online degree programs. With online associate degrees in areas like addictions counseling, Bible, and intercultural studies, students can prepare for work in a variety of fields. The university also offers online bachelor's degrees in fields including psychology, counseling, business, and education. Students enrolled in online programs at Southwestern Assemblies of God University have access to resources including the library, three Learning Centers, and academic accommodations. Southwestern Assemblies of God University is regionally accredited by the Southern Association of Colleges and Schools Commission on Colleges (SACSCOC). Texas A&M University ranks among The Best Online Colleges in Texas for 2018! Part of the Texas A&M University System, Texas A&M University-College Station is a public, non-profit university that serves over 65,000 students. Founded in 1871 as a public land-grant institution, Texas A&M University-College Station is one of the largest campuses in the nation, sitting on more than 5,200 acres of land. Students at Texas A&M University-College Station can choose from more than 130 undergraduate degree programs, 170 master's degree programs, 93 doctoral degree programs, and five professional degrees. Many of Texas A&M University-College Station's degrees are also offered online. With an online bachelor's degree in nursing, a host of online master's programs, and several online PhD degree options, Texas A&M University-College Station offers flexible online programs that will suit a variety of students. Students in Texas A&M University-College Station's online programs have access to a variety of resources, including library services, student assistance services, disability services, multicultural services, student affairs, and counseling. Texas A&M University-College Station is regionally accredited by the Southern Association of Colleges and Schools Commission on Colleges (SACSCOC). University of Houston ranks among The Best Online Colleges in Texas for 2018! Founded in 1927, University of Houston is a public, non-profit university that serves nearly 44,000 students. It is one of the best online colleges in Texas that offers a variety of bachelor's, master's, and doctoral programs. With 2,600+ faculty members and 25 research centers, students have access to a wealth of knowledge and instruction. Students may select from a variety of online undergraduate, graduate, and professional degree and certificate programs. Online programs at the University of Houston have the same rigorous standards as their on-campus programs. Degree programs include nursing, psychology, engineering, education, management, and social work. Seeking to meet a variety of needs, the University of Houston's online offerings include innovative programs like certificate courses, workshops, conferences, individual courses, and custom-designed corporate training. The university is committed to student success for its online students as well as its traditional, on-campus students. Resources for online students include library access, academic counseling, and a writing center. University of Houston is regionally accredited by the Southern Association of Colleges and Schools Commission on Colleges (SACSCOC). Tarleton State University ranks among The Best Online Colleges in Texas for 2018! Tarleton State University, a public university founded in 1899, enrolls more than 13,000 students. A member of the Texas A&M University System, Tarleton State University offers a variety of undergraduate, graduate, and doctoral degree programs, including more than 20 online bachelor's completion and master's degree programs. Tarleton State University provides a wide selection of online bachelor's degree completion programs including those in veterinary technology, business, psychology, criminal justice administration, and health professions technology. Before enrolling in one of these programs, students must have 30 hours of transferable credits. Students also can pursue nearly a dozen master's degree options, including agricultural and consumer resources, educational administration, information systems, music education, and quality and engineering management. The degree programs do not require residency, but some may require a campus visit. The university also offers military-friendly degree programs. Like at other online schools in Texas, students receive the same degree as on-campus students. Students in online programs at Tarleton State University also have access to a number of resources, including advising and library services. Tarleton State University is regionally accredited by the Southern Association of Colleges and Schools Commission on Colleges (SACSCOC). The University of Texas Rio Grande Valley ranks among The Best Online Colleges in Texas for 2018! Founded in 2013 as the first major public university of the 21st-century in Texas, The University of Texas Rio Grande Valley is an innovative, modern university that serves over 27,000 students. The University of Texas Rio Grande Valley houses a School of Medicine that offers a variety of cutting-edge programs. With bachelor's, master's, doctoral, and professional degree options, The University of Texas Rio Grande provides its students with a number of pathways for academic advancement. The University of Texas Rio Grande Valley offers an array of online degree programs, both in a traditional semester format and in an accelerated format. The majority of fully online degree programs offered include master's degrees in fields such as business administration, educational leadership, kinesiology, and physician assistant studies. Students can also complete fully online certificate programs, in specialties such as court interpreting, e-learning, and Spanish translation. The University of Texas Rio Grande Valley offers its online students extensive support with technology and online learning. Online students can also access library resources, advising, and other academic services. The University of Texas Rio Grande Valley is regionally accredited by the Southern Association of Colleges and Schools Commission on Colleges (SACSCOC). Midwestern State University ranks among The Best Online Colleges in Texas for 2018! Midwestern State University, founded in 1922, is a public, non-profit university offering bachelor's and master's degrees. Midwestern State University is the only university in Texas that belongs to the Council of Public Liberal Arts Colleges (COPLAC). Committed to being a public university that offers high quality liberal arts programs, Midwestern State University offers a number of liberal art programs, as well as degrees in other fields and specialties. The school serves over 6,000 students. Midwestern State University offers several online degrees through their Distance Learning department. With online options for bachelor's, master's, and certificate programs, students can pursue higher education in fields including nursing, criminal justice, sports administration, and educational leadership. Online students at Midwestern State University have access to the university library, academic advising, financial aid, and a career center. Midwestern State University is regionally accredited by the Southern Association of Colleges and Schools Commission on Colleges (SACSCOC). University of Houston - Downtown ranks among The Best Online Colleges in Texas for 2018! University of Houston-Downtown (UHD), a four-year, public state university founded in 1974, enrolls more than 14,000 students. A member of the University of Houston System, the University of Houston-Downtown offers more than 50 bachelor's and master's degree programs, including online bachelor's completion options and master's degrees through UHD Online. UHD Online students can earn bachelor's degrees in a variety of areas, including finance, supply chain management, professional writing, and criminal justice. Online students can pursue master's degrees in non-profit management, criminal justice and teaching. Most of the university's online degree programs are 100% online, but some may require site-based sessions such as orientation or laboratory experiences. Online students earn the same degrees as on-campus students. Online students at University of Houston-Downtown have access to a variety of services including the bookstore, library resources, and an online student orientation. University of Houston-Downtown is regionally accredited by the Southern Association of Colleges and Schools Commission on Colleges (SACSCOC). Wayland Baptist University ranks among The Best Online Colleges in Texas for 2018! Wayland Baptist University, a private, non-profit, Southern Baptist university, is more than 100 years old, founded in 1908 by a pioneer physician. The school offers over 65 degree programs. With online and on-campus programs in a variety of fields, Wayland Baptist University serves more than 5,000 students. With a number of fully online degree programs, Wayland Baptist University offers students quality and convenient distance learning options. Online programs through Wayland Baptist University allow students to earn the same degrees as traditional, on-campus students. Online students enrolled at Wayland Baptist University receive a variety of resources and support, including library access and financial services. Wayland Baptist University is regionally accredited by the Southern Association of Colleges and Schools Commission on Colleges (SACSCOC). The University of Texas at El Paso ranks among The Best Online Colleges in Texas for 2018! The University of Texas at El Paso, founded in 1914, is a public, non-profit school and member of The University of Texas System. Serving nearly 24,000 students, The University of Texas at El Paso is committed to offering a diverse, innovate array of options that serve the 21st-century student. With an 80% Hispanic student population and an additional 5% Mexican student population, the school is the only research and doctoral university in the United States with a Mexican-American majority. The University of Texas at El Paso offers a variety of fully online degree programs designed to serve nontraditional students. Online programs are offered through the university's Extended University platform, UTEP Connect, including bachelor's degrees in criminal justice, media advertising, Chicano studies, and nursing, master's degrees in defense and strategic studies, curriculum instruction, and systems engineering, and certificate programs in technical and professional writing, early intervention studies, and urban and regional planning. UTEP Connect offers academic and professional advancement opportunities for a diverse variety of students. Students enrolled in online programs at The University of Texas at El Paso through UTEP Connect have access to a variety of services and resources, including library access and academic advising. The University of Texas at El Paso is regionally accredited by the Southern Association of Colleges and Schools Commission on Colleges (SACSCOC). Stephen F Austin State University ranks among The Best Online Colleges in Texas for 2018! Stephen F. Austin University (SFA) is a public, non-profit university that serves over 12,000 students. Founded in 1917, the school offers bachelor's, master's, and doctoral degree programs. Stephen F Austin State University houses six colleges: the Nelson Rusche College of Business, the James I. Perkins College of Education, the College of Fine Arts, the Arthur Temple College of Forestry and Agriculture, the College of Liberal and Applied Arts, and the College of Sciences and Mathematics. Stephen F. Austin State University offers several online undergraduate and graduate degree programs through its distance education platform, SFA Online. Students can earn undergraduate degrees in programs including nursing and general business. Those who want to earn online master's degrees can study in programs including public administration, resource interpretation, and education. SFA Online also offers several certificate programs, including hospitality administration and family and consumer science. Online students at Stephen F. Austin University can access resources including library services, and tech support. Stephen F. Austin State University is regionally accredited by the Southern Association of Colleges and Schools Commission on Colleges (SACSCOC). University of Houston - Clear Lake ranks among The Best Online Colleges in Texas for 2018! Part of the University of Houston System, University of Houston-Clear Lake, a public, non-profit university, serves over 8,000 students with bachelor's, master's, and doctoral degree options. Founded in 1974, the school originally only offered degree completion courses for upperclassman, but, as of 2014, now offers freshman- and sophomore-level classes. With four schools—the College of Business, the College of Education, the College of Human Sciences and Humanities, and the College of Science and Engineering—University of Houston-Clear Lake has a variety of degree programs to fit a wide range of students. University of Houston-Clear Lake offers a number of online degree programs through its online platform, UHCL Online. For students looking for a flexible schedule and non-existent commute, UHCL Online offers programs that conveniently fit into the lives of nontraditional students. Online undergraduate programs include bachelor's degrees in anthropology, finance, public service leadership, and general business. Master's degree options for online students include specialties in business administration, engineering management, environmental science, and software engineering. Online certificates include master technology teacher and human resource management. University of Houston-Clear Lake is one of the best online schools in Texas to offer distance learners assistance, support, and resources from the university, including course support, financial aid, and academic advising. University of Houston-Clear Lake is regionally accredited by the Southern Association of Colleges and Schools Commission on Colleges (SACSCOC). 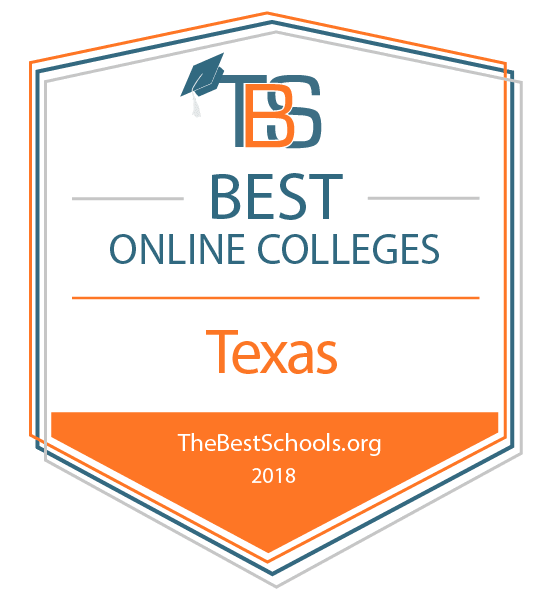 Houston Baptist University ranks among The Best Online Colleges in Texas for 2018! Houston Baptist University is a private, non-profit, Southern Baptist university. Founded in 1960, the college began instruction in September 1963 with a freshman class of 163 students and 30 faculty members. Today, Houston Baptist University serves over 3,000 students and offers bachelor's, master's, and doctoral degrees. With eight schools—the Archie W. Dunham College of Business, the College of Education and Behavioral Sciences, the College of Engineering, the College of Science and Mathematics, the School of Christian Thought, the School of Fine Arts, the School of Humanities, and the School of Nursing and Allied Health—students at Houston Baptist University have an array of academic opportunities available to them. Houston Baptist University offers a number of online learning opportunities. With 100% online undergraduate and graduate degree programs available, students can pursue higher learning at Houston Baptist University with the flexibility and convenience of distance learning. Online bachelor's degree programs include nursing, theological studies, psychology, and management. Online master's degree programs include kinesiology, education, Christian leadership, and human resources management. Online students at Houston Baptist University have access to a variety of resources, including library services, an office of student success, and other academic resources. The University of Texas at Arlington ranks among The Best Online Colleges in Texas for 2018! The University of Texas at Arlington (UTA) is a public, non-profit, research university. The school is part of The University of Texas System. Founded in 1895, the university has had eight names since its inception: Arlington College, Carlisle Military Academy, Arlington Training School, Arlington Military Academy, Grubbs Vocational College, North Texas Agricultural College, Arlington State College, and finally, The University of Texas at Arlington. UTA offers bachelor's, master's, and doctoral degrees, both in-person and online. The University of Texas at Arlington has offered online degrees since 1998. Focused on delivering distance learning programs that make learning accessible and convenient, especially for nontraditional students, UTA offers a variety of undergraduate and graduate online degree programs. Finish@UT is a fully online bachelor's degree completion program; the program offers a variety of concentration areas to meet students' needs and goals. Online master's programs include a Master of Public Administration. Students enrolled in UTA's online degree programs receive the same degrees as traditional, on-campus students. Support for online students includes library access, and academic advising. The University of Texas at Arlington is regionally accredited by the Southern Association of Colleges and Schools Commission on Colleges (SACSCOC). University of the Incarnate Word ranks among The Best Online Colleges in Texas for 2018! The University of the Incarnate Word (UIW), a private, co-educational Catholic university founded in 1881, enrolls about 9,900 students. The university offers a host of undergraduate, graduate, and doctoral and professional degrees, including a dozen bachelor's and master's degrees offered fully online through UIW Online. UIW Online's programs are asynchronous with no proctored exams, allowing students to complete coursework on their schedule. The university offers its courses in an accelerated format with eight-week terms. UIW Online students can pursue eight bachelor's degree options including applied arts and sciences, organizational development, business administration and health sciences. Depending on their degree choice, students also can pursue nearly two-dozen concentrations to help tailor their degree to their career goals. The university also offers master's degrees in administration, business administration, teacher leadership, and organizational development and leadership. Students pursuing an administration degree also can choose from five concentrations including organizational development and communication arts. Online students at UIW have access to library resources, a bookstore, career services and the Online Writing Center. The university offers a number of programs and supports for military students; they are enrolled in the GoArmyEd, Air University Associate to Baccalaureate Cooperative and Navy College Program Distance Learning Partnership. The university offers free textbooks for undergraduate students as well as special tuition rates for adults, active-duty military and veterans. The University of the Incarnate Word is regionally accredited by the Southern Association of Colleges and Schools Commission on Colleges (SACSCOC). Texas A&M University-Central Texas ranks among The Best Online Colleges in Texas for 2018! Texas A&M University-Central Texas (TAMUCT) is a public, four-year university that offers bachelor's and master's degrees. Part of the Texas A&M University System, TAMUCT began in 1999 as Tarleton-Central Texas, and joined the Texas A&M University System in 2009. The schools serves a diverse, growing student population of more than 2,500. TAMUCT has three colleges: the College of Arts and Sciences, the College of Business Administration, and the College of Education. Texas A&M University-Central Texas offers several 100% online bachelor's and master's degrees. Online undergraduate programs include aviation science, business management, and nursing. Online graduate programs include information systems, management and leadership, and a fully-online MBA program. Online students at Texas A&M University-Central Texas receive a variety of help and support from university faculty and staff. Resources include library services, student counseling, and a technology help desk. Texas A&M University-Central Texas is regionally accredited by the Southern Association of Colleges and Schools Commission on Colleges (SACSCOC). Texas A&M University-Commerce ranks among The Best Online Colleges in Texas for 2018! Texas A&M University-Commerce is another member of the Texas A&M University System. This public, non-profit university offers 100+ programs of study for bachelor's, master's, and doctoral students. Founded in 1889 as East Texas Normal College in Cooper, TX, the university moved to its current location in 1917 when the Cooper campus was destroyed by fire. Texas A&M University-Commerce is the fifth oldest university in Texas. With departments for Business, Education and Human Services, Humanities, Social Sciences, and Arts, Science and Engineering, and Agriculture, students at Texas A&M University-Commerce have a wide range of educational opportunities to choose from. Texas A&M University-Commerce offers hybrid and fully online distance learning programs so that students can get the benefits of attending the university plus the convenience of pursuing a degree from anywhere in the world. 100% online bachelor's degree programs include applied arts and sciences and general studies. Fully online graduate programs include master's degrees in education, applied criminology, and physics, as well as a doctoral degree in educational administration. Texas A&M University-Commerce faculty and staff are eager to help online students have the best possible learning experience. Resources include library services, bookstore access, technical support, and academic assistance. Texas A&M University-Commerce is regionally accredited by the Southern Association of Colleges and Schools Commission on Colleges (SACSCOC). Concordia University - Texas ranks among The Best Online Colleges in Texas for 2018! Concordia University-Texas is a private, non-profit, Christian, liberal arts university associated with the Lutheran denomination. Offering a variety of associate, bachelor's, master's, and doctoral degrees, the university serves nearly 3,000 students. Founded in 1926, Concordia University-Texas was originally established as a high school. With satellite campuses throughout Texas and a range of online degree programs, Concordia University-Texas meets the needs of a variety of students, both in-person and online. Classes at Concordia University-Texas are taught from a Christian perspective. Fully online programs at Concordia University-Texas offer the same curriculum, only in a flexible, convenient format. Online bachelor's programs include communication, computer science, business, and psychology. Online master's programs include education, sports administration, and nursing. Distance learning programs at Concordia University-Texas maintain the school's Christian mission and offer high quality Christian online instruction. Online students at Concordia University-Texas have access to a variety of resources, including a student handbook, academic catalog, success center, career services, orientation, and library and bookstore services. Concordia University-Texas is regionally accredited by the Southern Association of Colleges and Schools Commission on Colleges (SACSCOC). The University of Texas at Tyler ranks among The Best Online Colleges in Texas for 2018! The University of Texas at Tyler (UT Tyler) is a public, non-profit university and member of the University of Texas System. Founded in 1971, this fast-growing university currently serves almost 10,000 students. UT Tyler houses seven academic colleges: Arts and Sciences, Business and Technology, Education and Psychology, Engineering, Nursing and Health Sciences, The Ben and Maytee Fisch College of Pharmacy, and University College. With three campuses, a center, and online options, The University of Texas at Tyler offers students a variety of ways to earn degrees and reach their academic and professional goals. Online programs at The University of Texas at Tyler are offered through the school's University College. Online bachelor's degree programs include nursing and applied arts and sciences. Online master's degree programs include education, English, criminal justice, nursing, and business administration. Students enrolled in University College programs at The University of Texas at Tyler receive support through the Academic Success Center, University Library, and IT Support department. The University of Texas at Tyler is regionally accredited by the Southern Association of Colleges and Schools Commission on Colleges (SACSCOC). Angelo State University ranks among The Best Online Colleges in Texas for 2018! Founded in 1928 as Angelo State College, today Angelo State University (ASU) serves nearly 10,000 students. A member of the Texas Tech University System, Angelo State University offers a variety of bachelor's, master's, and doctoral degrees, as well as certificate programs. ASU has over 100 majors and concentrations, offered through six colleges: the Archer College of Health and Human Services, the College of Arts and Humanities, the College of Business, the College of Education, the College of Graduate Studies and Research, and the College of Science and Engineering. Angelo State University offers a number of online degree and certificate programs. Online programs include nursing, education, and business. Online students at Angelo State University receive the same degree as students enrolled in traditional, on-campus degree programs. Faculty and staff at Angelo State University are committed to helping online students learn and succeed. Angelo State University is unique among online schools in Texas because it employs a team of eLearning staff members to assist and support online students. Resources include library access and academic advising. Angelo State University is regionally accredited by the Southern Association of Colleges and Schools Commission on Colleges (SACSCOC). Southwestern Adventist University ranks among The Best Online Colleges in Texas for 2018! Southwestern Adventist University is a private, non-profit university affiliated with the Seventh Day Adventist church. Established by pioneers in 1894 as a primary school, the school originally served 56 students in all grades. Eventually the school, then named Keene Industrial Academy, expanded to offer junior college work in 1916, bachelor's degrees in 1967, and graduate programs in 1987. Today Southwestern Adventist University offers associate, bachelor's, and master's degrees and serves around 800 students. Programs offered through the Distance Education department at Southwestern Adventist University serve students who need flexibility in learning due to family, work, or other commitments. The Distance Learning program at Southwestern Adventist University has operated for over 35 years and offers a variety of online associate and bachelor's programs in fields including history, psychology, religion, business, and education. Online students at Southwestern Adventist University receive technical and academic support from university faculty and staff. Resources include library access, financial aid, and support from the Distance Education department. Southwestern Adventist University is regionally accredited by the Southern Association of Colleges and Schools Commission on Colleges (SACSCOC). University of St. Thomas ranks among The Best Online Colleges in Texas for 2018! University of St. Thomas is a private, non-profit, Catholic university. Founded in 1947, University of St. Thomas has been delivering high quality Catholic education for 70+ years. The school offers bachelor's, master's, and doctoral degree programs, both on campus and online. With five schools—the School of Arts and Sciences, the Cameron School of Business, Education and Human Services, the Peavy School of Nursing, and the School of Theology—University of St. Thomas serves over 3,000 students. Online programs at University of St. Thomas create accessible learning opportunities for nontraditional students. The online programs include the same curriculum, standards of instruction, and support as on-campus programs. Students enrolled in online degree programs receive the same diploma as traditional students from University of St. Thomas. Online degree programs include a Master of Education program. Online students at University of St. Thomas receive an array of resources and support, including library services and financial aid. University of St. Thomas is regionally accredited by the Southern Association of Colleges and Schools Commission on Colleges (SACSCOC). The list includes a diverse, varied assortment of schools in Texas that offer online degrees. Some of the universities are small, serving less than 1,000 students, while others are big institutions with tens of thousands of enrolled students. Some of the schools are public, while other organizations are private; some are religiously affiliated while others are secular. Each of the schools on this list offers a number of strong online degree and certificate programs. We know that students are diverse in their identities, backgrounds, goals, and needs so we created a list to help you find an online degree program at a school in Texas that is the perfect fit for you.